When the job is challenging, one will need all the optimism in the world. For me, teaching as a career was a decision hinging on passion where returns could not be equated with worldly returns as other jobs have on offer. 15 years into it, the excitement of the job fails to wane and the thought of “doing our bit” lifts the morale when the chips are down. Computer education in schools, especially till middle grades, comes under an open curriculum framework where the learning outcomes for each grade are at the discretion of the school. Hence, the initial journey was indeed a bumpy one. Due to disparities in curriculum over the years, the onus lies on computer teachers to either give in to the substandard publications available in the market, which are both unstructured and incoherent in nature, or design and implement a curriculum by introspecting – planning – strategizing the milestones for each grade. The latter prompted me to proactively study and bring in some parity. Designing of Computer Curriculum (VI-VIII) by the competent members of Computer Department of Genesis Global School resulted after a lot of Experiential Research to impart certain newness to the mundane curriculum prevalent over the years. For students, good ICT skills are required to understand, use and improve their routine use of technology at personal and future workspaces. Good Coding skills help harness problem solving and critical thinking skills in every sphere of life. The curriculum was implemented with a modular approach that implied having well-defined learning outcomes for each grade. Two years hence, the feedback received from parents and students has been heartwarming, with many parents conveying their happiness and satisfaction in person and in public. In the past few years, Laurels that students have brought for themselves and the school in various competitions of Computer Sciences such as: “International App Development Competition” (Coding Skills), Copious Microsoft Office Specialist certifications (ICT skills) stand testimony to make this curriculum an indispensable learning field to reckon with. Furthermore, the yield of this learning is and will be reflected in the secondary and senior secondary levels, where ICT or Computer Sciences are major components of the respective curriculum. Though the real outcomes with better cognitive and critical thinking skills will become evident and an integral part of their lives only in the years to come. Neha Chauhan is a competent educationist who holds an M.Phil & Masters degree in Computers, along with a PG Diploma in Educational Administration and Supervision. 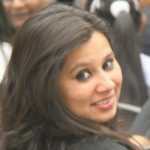 She has a career spanning over 14 years in the field of Computer Science education at prestigious schools in Delhi and has Headed the Computer Department at Mater Dei Convent School, New Delhi from 2008-2014. Ms. Chauhan was the key force behind the computerization of School procedures by creating and developing School Information-System. Presently, she works with Genesis Global School, Noida, Uttar Pradesh. She has been associated with revolutionary ICT projects that have been instrumental in changing the face of ICT usage in the school’s environment.